Summer Streets has hit NYC's streets for the 4th year in a row. This Saturday, August 13th, The NYC Department of Transportation will shut down Park Avenue and connecting streets from the Brooklyn Bridge all the way up to Central Park to automobile traffic and open it up to pedestrians, runners, bikers and fun events all for FREE! This event is for the early birds, so if you're not, make sure to set an alarm so you don't miss it. Summer Streets takes place from 7am until 1pm this Saturday, August 13th. Expect to frolic amidst nearly 7 miles of car-free fun. Free bicycle and rollerblade rentals, a 30-foot rock climbing wall, yoga, running, bike tutorials, picnic areas, fitness classes, giveaways, contests, and more all for FREE! 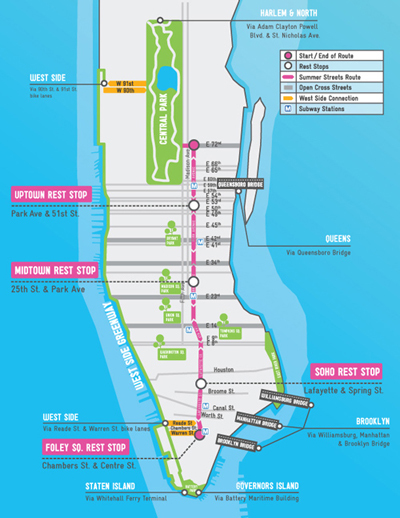 Click here for the entire Summer Streets schedule. If you can't make it this weekend, August 20th is the 3rd and final day of Summer Streets this year.